A pocket door system that enables doors to slide conveniently into a wall cavity and save space whilst looking incredibly stylish. To create a double pocket door you will need to purchase two single pocket door systems and a double leaf conversion kit. Easy to assemble without requiring any modifi­cations, the conversion kit includes a double top rail and two spacers. Easy to install with a rigid frame, the pocket door systems are supplied pre-assembled so that they can be fitted in half the timed of other brands. Available for both single and double door situations in a selection of sizes, almost all of JB Kind's internal doors are suitable for use as a pocket door. Easy to install rigid frame, supplied pre-assembled. Fitted in half the time of other brands. Designed for stud and plasterboard. The internal pocket cavity is protected by a cover during installation. Door is fitted after all installation and decoration has been completed, avoiding any potential damage to your door. Door choice can be changed in the future without structural alteration to the wall. Maximum door weight of 80Kg. Compatible sliding door hardware available. Available in single or double format. (For a Double Pocket System you need to purchase two Single Pocket Door Systems and a Double Leaf Conversion Kit). Internal doors that are being fitted into a pocket door system will need a groove machining into the bottom edge, to allow the door to fit in the floor guide. You can find the cost for grooving a single or double pocket door on the pocket door system page. You will need to purchase the doors at the same time. Ready assembled for easy and accurate installation. The cassette structure is made from 0.5mm galvanised steel. The cassette sides are formed from single pieces of pressed steel which is corrugated for complete stability. Transverse ribs fixed to the corrugations further re-inforce the structure and allow fixing of plasterboard direct to the cassette. Twin spacer bars are supplied that are fixed between the cassette and jamb during installation to ensure the structure remains square. How to order your Pocket Door Systems! Take a moment to check your pocket door size requirements against our size guide tables. And don't forget, if you want to order a double double pocket door, you will need to purchase two single pocket door systems and a double leaf conversion kit. 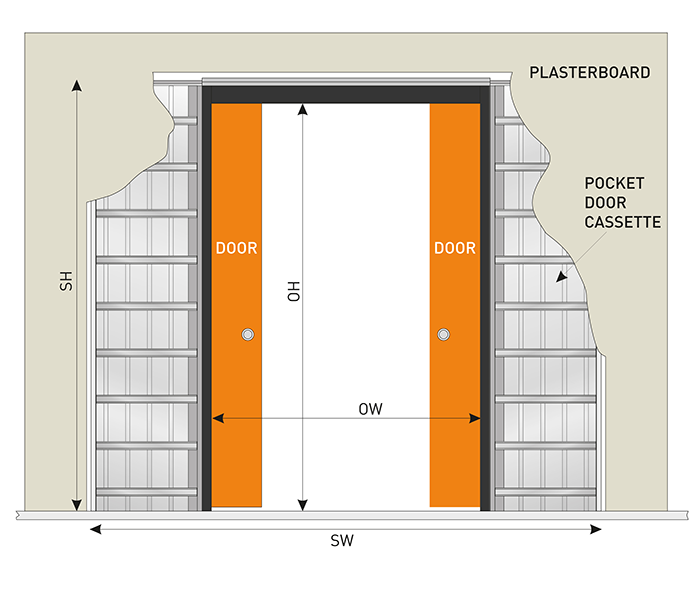 ( View the Single Pocket Door System & Purchase here ). Whatever type of pocket door you choose, you'll need an accessory kit as the pocket door system cannot be installed without one. Choose from either white primed or varnished oak, available for both single and double pocket door systems. ( View & Purchse the Timber Accessories Kit here ). This might sound complicated and costly but it really isn't, it just needs to be done! Door grooving is when the bottom edge of the door is grooved to fit in the floor guide of a pocket system. Save your joiner or builder some time, as the JB Kind in-house joinery workshop can pre-groove your doors prior to delivery. It'll only be a small additional charge - see the Pocket Door System page. JB Kind Double Pocket Door System Codes - DBLLEAFKIT686 - DBLLE­AF­KIT762 - DBLLE­AF­KIT838 - DBLLE­AF­KIT915 - Must be fitted and treated to manufacturer's instructions. - We cannot exchange Double Pocket Door Systems after order - JB Kind Double Pocket Door Systems Conversion Kit are supplied as a Special Order. Please order doors from any other manufacturer on a separate order, otherwise the shipping will not be calculated correctly. E. & O.E. see T&C - We do try to keep prices and specifi­cations Pocket Door Systems & Doors correct, but mistakes can be made!